If you read my post on Polenta with Feta, Tomatoes, and Kalamata Olives dated June 4, 2010 you know that we are fairly new to working with polenta. In that recipe we used a refrigerated polenta product found in the produce section of the store, and it was fairly good. However, this time around we tackled the procedure for making polenta from a recipe of ingredients including corn meal, milk, parmesan cheese, fresh basil, fresh garlic, and chili pepper flakes. And the result, we will never go back to store bought polenta again! Polenta is similar to grits in being a corn based product that is cooked with a liquid ingredient, along with spices, cheeses, and protein, then thickened up a bit and served either warm or paned, cooled and shaped. It has a similar characteristic in that of a blank canvas, add you own combination of spices, herbs, vegetables, protein, dairy, and you have an endless array of combinations and permutations with this polenta. The vegetables in this roasted recipe can include any of your favorite, here are some suggestions; asparagus cuts, sweet peppers large diced, zucchini sliced, mushrooms quartered, yellow squash sliced, red onions sliced cauliflower florets, broccoli florets, baby carrots or slices, eggplant large diced, cucumbers. The vegetables used in this recipe are included in the ingredient list below. 1. Preheat oven to 375°. In a large bowl combine the vegetables with ¼ cup of the olive oil and ¼ teaspoon of the sea salt. Toss well to evenly coat, then add the vegetables to a 9×13 roasting pan. Roast in oven, uncovered for about 15 minutes, the stir once and return to oven, continue to roast for another 15 minutes or until al dente, or crisp but not over cooked. 2. Meanwhile, to prepare the polenta heat the 1 tablespoon of olive oil in a large sauce pan over medium heat. Then add the garlic and red chili pepper flakes and saute for about a minute or two, stirring often. Stir in the milk and 1 cup of vegetable stock, and bring to just under a boil. The liquid will steam up just a bit, but will not be boiling. While the garlic / stock / milk mixture is simmering combine the remaining 1 cup of vegetable stock with the corn meal and stir together well to a smooth paste. Slowly add the cornmeal mixture to the hot milk mixture, stirring constantly. Bring this to a boil, and then reduce heat to low. Cook this uncovered for about 10 minutes, or until the mixture has thickened, stir frequently. Fold in the fresh chopped basil, and ½ cup of the shredded parmesan cheese along with the remaining ½ teaspoon of sea salt. 3. To serve, spoon the warm polenta into a serving plate or bowl, then top with the roasted vegetables, then garnish with the remaining parmesan cheese and mixed baby greens. Optional: Pour the warm polenta into a greased sheet pan and smooth the mixture evenly into the pan. Allow to cool to room temperature and set up, then cut into portions, such as squares, or cut out rounds with a mold, then serve as above. It”s gorgeous with the roasted vegetables – complements them perfectly and really makes a meal. I love baking them later to serve with anything and I mean anything. Came across your blog site Chef & enjoyed reading your ‘about me’ page. Its great to connect, I’ve subscribed, so looking forward to reading more over time. So healthy, so fresh and so appealing! Thank you for sharing. Looks wonderful. I have been thinking of trying to make some polenta myself soon. Great post, love the roasted vegetables with it! 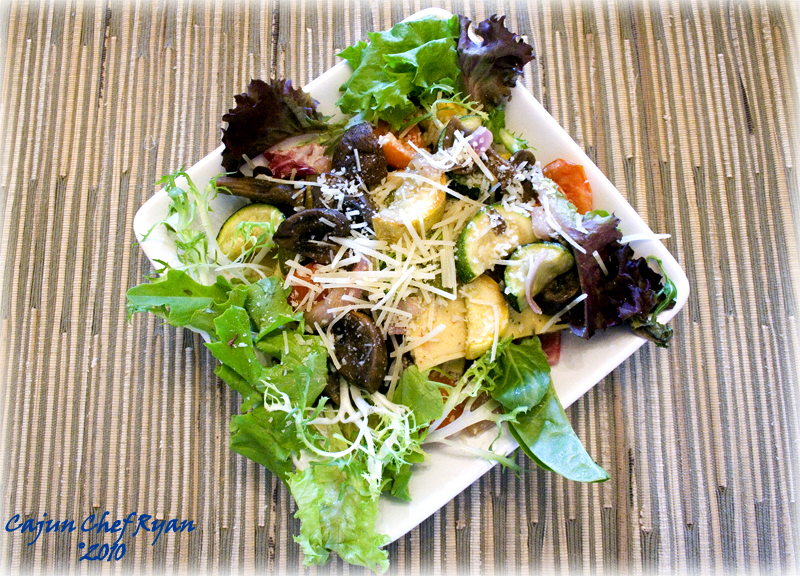 Love roasted veggies…love polenta…this is a hit in my book! This looks very tasty. I have never used milk when I make polenta. I’llhave to give it a try. I think of polenta as Italian grits. Ah yes, polenta is definitely on the mind right now as the temperatures drop. 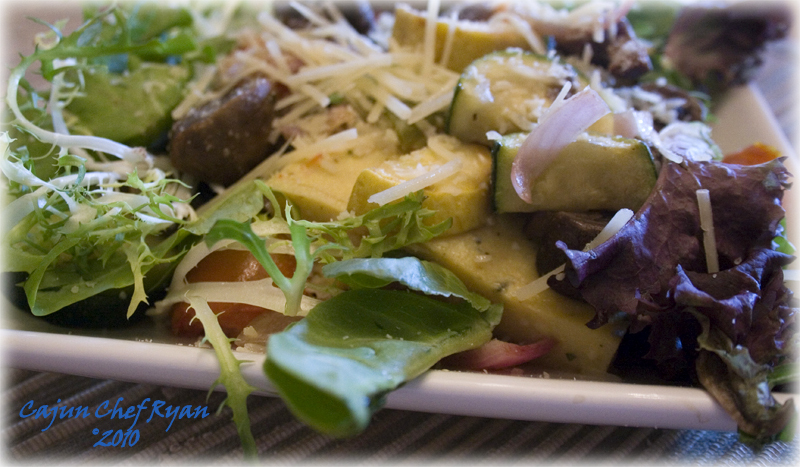 This is a beautiful salad – what a rich flavor there must be with the roasted veggies. I’m fairly new to Polenta as well but will never go back to store-bought after making it at home a few times! 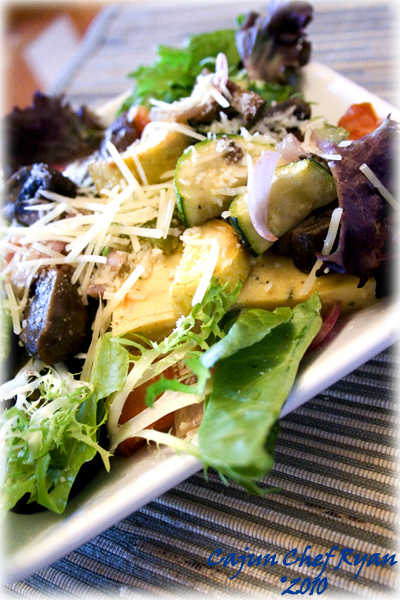 Yours with the roasted vegetables sounds absolutely divine! This looks delicious. A great way to add just that little extra for a special dish. Home cooked polenta can’t be beat. wow now this is a portrait of fabulous good food, healthy and I love polenta, what a great creation! I enjoy polenta when is crispy and baked – with roasted vegs is superb! I love polenta. I like to have it in the winter…nice and hot with lots of parmesano reggiano! Delicous. healthy and yummy looking dish! I love polenta and it sounds terrific with roasted veggies! I’ve never tried readymade polenta before (only recently discovered it actually existed! Not sure if you can get it here) so I’m very happy to hear it is inferior to making it yourself. I have never tried polenta but this looks so delicious. Love all the wonderful veggies. This reminds me that I do not make polenta often enough which is crazy because I like it just about any way it can be prepared. Seems that roasted or grilled veggies would be perfect with it. Good stuff and great color!